Not to be confused with Micropub. A microbrewery or craft brewery is a brewery that produces small amounts of beer (or sometimes root beer), typically much smaller than large-scale corporate breweries, and is independently owned. Such breweries are generally characterized by their emphasis on quality, flavor and brewing technique. The microbrewing movement began in the United Kingdom in the 1970s, although traditional artisanal brewing existed in Europe for centuries and subsequently spread to other countries. As the movement grew, and some breweries expanded their production and distribution, the more encompassing concept of craft brewing emerged. A brewpub is a pub that brews its own beer for sale on the premises. Although the term "microbrewery" was originally used in relation to the size of breweries, it gradually came to reflect an alternative attitude and approach to brewing flexibility, adaptability, experimentation and customer service. The term and trend spread to the US in the 1980s and was eventually used as a designation of breweries that produce fewer than 15,000 U.S. beer barrels (1,800,000 liters; 460,000 U.S. gallons) annually. Microbreweries have adopted a marketing strategy that differs from those of the large, mass-market breweries, offering products that compete on the basis of quality and diversity instead of low price and advertising. Their influence has been much greater than their market share, which amounts to only 2% in the UK, indicated by the introduction by large commercial breweries of new brands for the craft beer market. However, when the strategy failed, the corporate breweries invested in microbreweries or, in many cases, acquired them outright. Microbreweries gradually appeared in other countries, such as New Zealand and Australia. Craft beer and microbreweries were cited as the reason for a 15 million L (4.0 million US gal) drop in alcohol sales in New Zealand over 2012, with New Zealanders preferring higher-priced premium beers over cheaper brands. The website The Food Section defines a "nanobrewery" as "a scaled-down microbrewery, often run by a solo entrepreneur, that produces beer in small batches." The US Department of the Treasury defines nanobreweries as "very small brewery operations" that produce beer for sale. The term "farm brewery" or "farmhouse brewery" has been around for centuries. Several beer styles are considered "farmhouse", originally stemming from farmers brewing low ABV beer as an incentive for field workers. Farm breweries were not large scale; they had smaller, more unique, methods of brewing and fermenting in comparison to the larger breweries of the time. This had different effects on the overall product, creating unconventional beer flavors. The term "farm brewery" has more recently found its way into several local and state laws, in order to give farm breweries certain, often agriculturally related, privileges not normally found under standard brewery laws. These privileges usually come at a price: some portion of the ingredients (such as grains, hops, or fruit) used in the beer must be grown on the given licensed farm brewery. "Craft brewing" is a more encompassing term for developments in the industry succeeding the microbrewing movement of the late 20th century. The definition is not entirely consistent but typically applies to relatively small, independently-owned commercial breweries that employ traditional brewing methods and emphasize flavor and quality. The term is usually reserved for breweries established since the 1970s but may be used for older breweries with a similar focus. A United States trade group, the Brewers Association, interested in brand transparency, offers a definition of craft breweries as "small, independent and traditional". The craft brewing process takes time and can be considered an art by the brewmasters. In the United Kingdom, the "Assured Independent British Craft Brewer" initiative is run by the Society of Independent Brewers (SIBA), who ensure that any beers which carry the Independent Craft Brewer logo are relatively small, independent and brewing quality beer. The use of cans by craft brewers in the US has doubled since 2012, with over 500 companies using cans to package their beverages. Previously associated with the major brewing corporations, cans are now favored by craft brewers for numerous reasons: cans are impervious to oxygen, beer-degrading light does not affect canned beer, canned beer is more portable since less room is required for storage or transportation, canned beer cools more quickly, and cans have a greater surface area for wraparound designs and decorations. The perception that bottles lead to a taste that is superior to canned beer is outdated, as most aluminum cans are lined with a polymer coating that protects the beer from the problematic metal. However, since drinking directly from a can may still result in a metallic taste, most craft brewers recommend pouring beer into a glass prior to consumption. In June 2014, the BA estimated 3% of craft beer is sold in cans, 60% is sold in bottles, and kegs represent the remainder of the market. Brewpub is an abbreviated term combining the ideas of a brewery and a pub or public-house. A brewpub can be a pub or restaurant that brews beer on the premises. Beer arrived in Australia at the beginning of British colonisation. In 2004, Australia was ranked fourth internationally in per capita beer consumption, at around 110 L (29 US gal) per year, though considerably lower in terms of total per capita alcohol consumption. The most popular beer style in modern-day Australia is lager. The oldest brewery still in operation is the Cascade Brewery, established in Tasmania in 1824. The largest Australian-owned brewery is the family-owned Coopers, as the other two major breweries, Foster's and Lion Nathan are owned by the British-South African SABMiller and the Japanese Kirin Brewing Company respectively. Foster's Lager is made mostly for export or under licence in other countries, particularly the UK. In Canada, microbreweries flourished mostly on the West Coast, in Québec and in Ontario where a large domestic market was dominated by a few large companies. Many of Ontario's microbreweries subsequently formed the Ontario Craft Brewers association. Some other provinces also have similar associations. There is no consistent definition of microbrewery across Canada. In fact, the various Provincial governments define small brewery, microbrewery, macrobrewery and nanobrewery, with each classification depending on the number of hectolitres produced and that number varies from province to province. Still, most of the craft or microbrewers tend to be small and locally owned, often by families. Some such breweries have been sold to major corporations but they are still referred to as craft brewers or microbreweries by most news media; after such a change in ownership, however, they may no longer qualify as members of the Provincial craft brewers associations. Most microbreweries fall within the more commonly used term "craft breweries". In 2006 there were 88 such operations in Canada, increasing to 520 by 2015. The growth is particularly obvious in Ontario, with a 36% increase in sales for this category of brewery. On a Canada-wide basis in 2015, such breweries held about a 10% market share. In 1984, changes to outdated liquor control laws allowed Paul Hadfield, a former architect, to open the Spinnakers Gastro Brewpub and Guesthouse in Victoria, British Columbia. Hadfield then expanded into "brew-inspired" jellies, chocolates, baked goods and vinegars. Microbreweries have also increased in number in Asia. China, the world's largest beer consumer as of July 2013, is home to a growing craft beer market, with brands such as Slowboat Brewery, Shanghai Brewery, and Boxing Cat Brewery. By July 2013, the number of brewpubs in Shanghai, China had doubled since 2010. General beer consumption reached 50 million L (13 million US gal) in early 2013 and an increasing interest in craft beers developed accordingly. The Great Leap Brewing Company is one example of numerous microbreweries that have been recently established, with a localization strategy leading to the use of traditional Chinese ingredients and spices in the Beijing brand's beer production process. China's largest brewpub is located in Suzhou and is managed by the Taiwanese brewing company Le Ble D'or, while craft beer consumers are both ex-pats and native Chinese. In Taiwan, where a single beer company dominates the market, the craft beer market has grown with brewers such as Redpoint Brewing Company gaining increasing market exposure through local bars and restaurants. This market trend has been accompanied by craft beer festivals where expat and Taiwanese brewers showcase their beer. Cambodia's first microbrewery, Kingdom Breweries, opened in 2009 and brews dark, pilsener, and lager beers. In Sri Lanka, over strict laws made it almost impossible for any craft beer to be brewed. On the remote East Coast, however, "Arugam Bay Surfer's Beer" managed to maintain a small, but popular brewpub. Established in 1977, the Siam View Hotel escaped regulations due to the long civil war and its remoteness. For two years running, the Daily Telegraph "Best of British" awarded the Siam View Hotel the "Best Pub in Sri Lanka" medal. In Denmark microbreweries have occurred throughout the country in increasing numbers. Small microbreweries often relate to restaurants and pubs, but local microbrewed craft beers are also sold in stores. Estonia has a tradition of home-brewed farm beers which are often flavoured with juniper. Craft beer came late to Estonia, but that began to change in 2012 when Mikkeller brewed a custom beer for the Estonian market, called Baltic Frontier. Then one local brewer in particular, Põhjala, led the way for other Estonian microbrewers such as Lehe, Koeru and Õllenaut. By 2017 there were nearly 30 microbreweries on the Estonian market, in a country with a population of only 1.2 million. Since 2015 Põhjala Brewery has organised an annual craft beer festival called "Tallinn Craft Beer Weekend". The legislation in Finland allows craft breweries to sell their products directly to consumers. Some, such as those in Germany, have been brewing traditionally for hundreds of years. In Germany, there were 901 small breweries in 2010. The Federal Statistical Office defines a small brewery as a brewery with a production of less than 5,000 hectoliters (132,086 US gallons) beer p.a. Small breweries pay a reduced beer tax. The total market share of the small breweries is less than 1%. 638 of them have a production even less than 1,000 hl (26,417.2 US gal.) p.a. and can be considered as microbreweries in a narrow sense. The figures apply to commercial breweries only and do not include hobby brewing. About one third of the small breweries have a tradition going back up to 500 years, most of them in Franconia. About two thirds were founded in the last 25 years. The vast majority of small breweries operate in combination with a brewpub. Whereas in other countries, microbreweries and brewpubs have risen in reaction to the mass production and marketing of beer, in Germany, the traditional brewpub or Brauhaus remains a major source of beer. This is mainly true for the South of Germany, especially the state of Bavaria. Upper Franconia, a district in the Region Franconia in the north of Bavaria, has the highest density of breweries in the world. Upper Franconia has about one million inhabitants and about 200 breweries. Many of them are microbreweries or brewpubs. Ireland has a long and proud history of brewing and in the past two decades, there has been a resurgence in craft breweries. Although the Irish market remains dominated by three multinational brewing concerns (Diageo, Heineken and C&C), there have been four so-called waves of growth in the Irish craft beer market. The number of microbreweries in Ireland has risen from 15 in 2012 to over 72 by 2017. In recent years, many microbreweries have opened in Italy, due to increasing beer popularity among young people. According to Coldiretti, microbreweries have grown in ten years by 1900%. There are more than 600 microbreweries active in Italy. An early boom in small regional microbreweries followed Japan's 1994 revision of tax laws allowing the establishment of smaller breweries producing 60,000 litres (13,000 imp gal; 16,000 US gal) per year. Before this change, breweries could not get a license without producing at least 2,000,000 litres (440,000 imp gal; 530,000 US gal) per year. Beer produced by microbreweries in the early 1990s was commonly referred to as Ji Bīru (地ビール), or "local beer." In the late 2000s more established microbreweries in Japan have chosen to emphasize the term Craft Beer (クラフトビア) to mark a break with the short-lived Ji Bīru boom and to emphasize the traditional brewing skills and reverence for ingredients that characterize their products. After Oslo Microbrewery was established in 1989, the number of microbreweries in Norway has expanded rapidly and sharply in the recent decades. Interest and expertise among Norwegians about craft brewed beer has risen sharply in a short time, and the old brewery traditions of this country are revived. Local microbreweries are scattered across Norway, from Lindesnes in the very south, and to the northernmost microbrewery in the world, Svalbard Bryggeri at Svalbard. History of beer in Singapore dates back to the mid-19th century. In Spain in 2011, the newspaper El País reported a "revolution is occurring in craft beer" (cervezas artesanales) and more recently that by 2013 the trend had extended to the autonomous communities of Catalonia, Valencia, Basque Country and Madrid. In Sweden, microbreweries have existed since around 1995. Today, the market is flourishing with many of the nation's regions and cities having their own breweries, such as Gotlands Bryggeri, Jämtlands Bryggeri, Helsingborgs Bryggeri and Wermlands Brygghus. Stefan Persson, the CEO of Swedish clothing chain H&M, has his own microbrewery on his estate in England. Following the introduction of American microbrews in 2012, the popularity of craft beer bars in Thailand—primarily Bangkok—increased fairly rapidly and in January 2014, the fourth global location of Danish microbrewery Mikkeller was launched in Bangkok. The brand partnered with an already established beer distribution company and seeks to capitalize on the higher earning capacity of Thai people in the second decade of the 21st century, as well as tourists. At the opening, one of the owners explained: "... and we thought it was about time to elevate the level of craft beer available in Thailand and, hopefully, expand throughout Southeast Asia." A total of 30 beers are served at the venue, including two microbrews exclusive to Thailand. The term "Microbrewery" originated in the UK in the late 1970s to describe the new generation of small breweries that focused on producing traditional cask ale independently of major brewers or pub chains. In 1972 Martin Sykes established Selby Brewery as the first new independent brewing company for 50 years. The Miners Arms brewpub at Priddy in Somerset followed in 1973. Another early example was the Litchborough Brewery founded by Bill Urquhart in 1974 in the Northamptonshire village of the same name. Urquhart had been the final head brewer at the large Phipps Northampton brewery, when it was closed by owners Watney Mann in May 1974 to make way for Carlsberg Group's new UK lager brewery on the site. Alongside commercial beer brewing, training courses and apprenticeships were offered with many of the UK movement's early pioneers passing through Litchborough's courses prior to setting up their own breweries. The UK also has a large number of small commercial breweries making cask ale, the smallest of which are known as microbreweries, and they can be found in small spaces such as domestic garages. In the UK, a lesser divide exists between the microbreweries and the large companies, as breweries of all sizes exist to fill the gap. Before the development of large commercial breweries in the UK, beer would have been brewed on the premises from which it was sold. Alewives would put out a sign—a hop pole or ale-wand—to show when their beer was ready. The medieval authorities were more interested in ensuring adequate quality and strength of the beer than discouraging drinking. Gradually men became involved in brewing and organized themselves into guilds such as the Brewers Guild in London of 1342 and the Edinburgh Society of Brewers in 1598; as brewing became more organized and reliable many inns and taverns ceased brewing for themselves and bought beer from these early commercial breweries. However, there were some brewpubs which continued to brew their own beer, such as the Blue Anchor in Helston, Cornwall, which was established in 1400 and is regarded as the oldest brewpub in the UK. In the UK during the 20th century, most of the traditional pubs which brewed their own beer in the brewhouse round the back of the pub, were bought out by larger breweries and ceased brewing on the premises. By the mid-1970s, only four remained: All Nations (Madeley, Shropshire), The Old Swan (Netherton, West Midlands), the Three Tuns (Bishop's Castle, Shropshire) and the Blue Anchor pub (Helston, Cornwall). 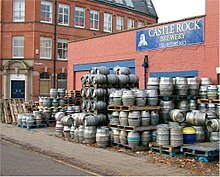 The trend toward larger brewing companies started to change during the 1970s, when the popularity of the Campaign for Real Ale (CAMRA)'s campaign for traditional brewing methods, and the success of Michael Jackson's World Guide to Beer encouraged brewers in the UK, such as Peter Austin, to form their own small breweries or brewpubs. In 1979, a chain of UK brewpubs, known as the "Firkin" pubs, started, running to over one hundred at the chain's peak; however, the chain was sold and eventually its pubs ceased brewing their own beer. Some British brewpubs specialize in ale, while others brew continental lagers and wheatbeers. The Ministry of Ales, Burnley; The Masons Arms in Headington, Oxford; The Brunswick Inn, Derby (in 2010, half of the beers sold by the establishment were brewed on-site); The Watermill pub, Ings Cumbria; and the Old Cannon Brewery, Bury St Edmunds are some examples of small independent brewpubs in the UK. The city of Bristol was identified by The Guardian in May 2014 as an area where the microbrewery industry had flourished. Ten brewpubs, such as Zerodegrees, The Tobacco Factory, Copper Jacks Crafthouse and The Urban Standard, were identified as thriving Bristol craft beer establishments. The East End of London has also been a place for speciality craft beers and unique independent pubs and breweries. Again The Guardian has an interesting list of Craft Beer pubs in East London with local East End tour companies also showing the distinct food and craft beer pubs to London visitors with Craft Beer Tours. With craft beer becoming more popular each year a number of craft beer subscription clubs are available in the UK. This trend, which originated from the US, allows people from the UK to discover new craft beers much like their counterparts over the pond in the USA. In the US, award-winning homebrewer K. Florian Klemp wrote in 2008 that the craft beer movement was revived in 1965—subsequent to an earlier American era—when Fritz Maytag acquired the Anchor Brewing Company in San Francisco, thereby saving it from closure. American craft beer drinkers tend to have higher average incomes and demographically skew white, male, and generation X; however trends show an increasingly racially and ethnically diverse, female, and millennial demographic profile. In a June 2014 interview, the owner of an Oregon-based microbrewery explained: "You've got to do more than just make great beer. It's really about innovation, creativity—stepping outside the box of traditional beer marketing", while an employee explained that "heart and soul" is the essence of the operation. The turnaround of the Anchor Brewing Company in 1965, after it was acquired by Maytag, is considered a turning point for American beer, due to the revival of craft beer in the US, where microbrewing boomed after then-president Jimmy Carter de-regulated the beer market in 1979. During the same period, others turned to homebrewing and eventually a few of these brewers started to produce on a slightly larger scale. For inspiration, they turned to the centuries-old tradition of artisan beer and cask ale production that was continuing in the UK, Germany and Belgium. The New Albion Brewing Company was founded in 1976 and served as a blueprint for American brewers to build small-scale commercial breweries. The popularity of these products was such that the trend quickly spread and a large number of small breweries were founded, often attached to a bar (known as a "brewpub") where the product could be sold directly. As microbreweries proliferated, some became more than microbreweries, necessitating the creation of the broader category of craft beer. Craft brewing is most established in the US, where changes to US law laid the foundations for the expansion of craft brewing. The 1978 Carter homebrewing law allowed for small amounts of beer and wine, and, in 1979, Carter signed a bill to deregulate the brewing industry, making it easier to start new breweries; although, states could still enact local restrictions. As a result of deregulation, homebrewing became a popular hobby in the 1980s and 1990s, and, in the mid-1990s, homebrewers launched business ventures based on home-based hobby brewing. In 1979, 89 breweries existed in the US—the Brewers Association reports that in March 2013 a total of 2,416 US breweries were in operation, with 2,360 considered craft breweries (98 percent—1,124 brewpubs, 1,139 microbreweries, and 97 regional craft breweries). By 2015, the number of US craft breweries had grown to over 4,000. Additionally, craft brewers sold more than 15,600,000 US beer barrels (1.83×109 L; 480,000,000 US gal) of beer, which represented approximately 7.8% of the US market by volume. In 2007 the largest American craft brewery was the Boston Beer Company, makers of Samuel Adams. The West Coast has the most craft breweries and the Deep South has the fewest. The Brewers Association defines American craft brewers as "small, independent and traditional": "small" is defined as an "annual production of 6 million barrels of beer or less"; "independent" is defined as at least 75% owned or controlled by a craft brewer; and "traditional" is defined as brewing in which at least 50% of the beer's volume consists of "traditional or innovative" ingredients. This definition includes older microbreweries, which traditionally produce small quantities of beer, as well as other breweries of various sizes and specialties. The Brewers Association defines four markets within American craft brewing: microbreweries, with an annual production less than 15,000 US beer barrels (1,800,000 L; 460,000 US gal); brewpubs, which sell 25% or more of their beer on site; regional craft breweries, which make between 15,000 US beer barrels (1,800,000 L; 460,000 US gal) and 6,000,000 US beer barrels (700,000,000 L; 190,000,000 US gal), of which at least 50% is all malt or contains adjuncts that are used only to enhance flavor; and contract brewing companies, which hire other breweries to make their beer. The idea that brewers who had been in business for generations didn't qualify as "traditional" simply did not cohere for many members. Brewers have long brewed with what has been available to them. (Since the Brewers Association doesn't define craft beer—that idea remains up to the beer drinker—the definition doesn't differentiate on what type of beer craft brewers brew, as long as the majority of what they make is beer.) The revised definition also provides room for the innovative capabilities of craft brewers to develop new beer styles and be creative within existing beer styles. The revised definition removes the subjective assessment by Brewers Association staff of whether adjuncts "enhance" or "lighten" flavor in a particular beer. The 20-by-20 objective is an aspirational goal for our craft community, with an inspiring symmetry. I'm convinced this goal is within our reach if we, as an industry, continue to focus on our strengths and passions—making and delivering high-quality, innovative, full-flavored beer to craft beer enthusiasts. ... Additionally, by noting a commitment to quality and clarifying the place of homebrewers and brewing enthusiasts, we further acknowledge the critical role each plays in the health and growth of the craft brewing industry. The Brewers Association reported the production of craft beer has doubled between 2011 and 2016, with the number of breweries growing from 2,000 in 2011 to 5,200 in 2016. The craft breweries are also seeing an increase in beer tourism, seasonal brews, and a marketing effort to get more women involved in beer production. Craft Non-Alcoholic Beer, part of the craft beer market, is also on the rise with more breweries such as Surreal Brewing Company in California that are solely dedicated to creating non-alcoholic beers. Vietnam is the largest producer of craft beer in Southeast Asia, with microbreweries producing 31,000 hectolitres in 2018. With a beer culture that emerged during French colonisation and further influenced by Vietnamese students returning from overseas studies, as of 2018[update], there were 31 microbreweries in Vietnam. Established microbreweries include BiaCraft, Platinum Beers and Pasteur Street Brewing Company. ^ Alison Boteler (2009). The Gourmet's Guide to Cooking with Beer. Quarry Books. p. 15. ISBN 978-1-59253-486-9. Archived from the original on 11 October 2013. Retrieved 21 July 2011. ^ Oliver, Garrett (2011). "Craft brewing". In Oliver, Garrett (ed.). The Oxford Companion to Beer. Oxford University Press. pp. 270–271, 585. ISBN 0195367138. ^ Glover, Brian (1988). "New Beer Guide". A Guide to Britain's Small Brewery Revolution. David & Charles. pp. 5–19, . ISBN 0-7153-9147-X. ^ a b Oliver, Garrett (2011). "Craft brewing". In Oliver, Garrett (ed.). The Oxford Companion to Beer. Oxford University Press. pp. 270–271. ISBN 0195367138. ^ "Welcome to the Brewers Association". Brewersassociation.org. Archived from the original on 2012-03-15. Retrieved 2012-03-16. ^ Jonathan Duffy (November 28, 2001). "The plight of the micro-brewers". BBC News. Archived from the original on March 4, 2016. ^ Friedland, Josh. "nan·o·brew·e·ry". The Food Section. The Food Section. Archived from the original on 2014-06-26. Retrieved 2014-07-21. ^ "TTB GovBeer FAQs". U.S. Dept. of Treasury. U.S. Dept. of Treasury. Archived from the original on 2014-08-14. Retrieved 2014-07-21. ^ "Sahti and Related Ancient Farmhouse Ales". Archived from the original on 2017-10-05. ^ "Startup Assistance – Brewers Association of Maryland". Archived from the original on 2017-09-29. ^ a b "Craft Brewer Defined". Brewersassociation.org. Archived from the original on 26 August 2016. Retrieved 9 July 2016. ^ "What qualifies as craft beer?". USA Today. Archived from the original on 15 November 2016. Retrieved 29 June 2016. ^ "Assured Independent British Craft Brewers". Society of Independent Brewers. Retrieved 3 February 2019. ^ a b Lewis Wallace (10 June 2014). "Brewers Have Been All Bottled Up, But Now They're Canning It". NPR. NPR. Archived from the original on 21 June 2014. Retrieved 14 June 2014. ^ "DEFINING CRAFT BEER IN CANADA". BeerWinnipeg. BeerWinnipeg. 15 October 2015. Archived from the original on 12 January 2017. Retrieved 22 January 2017. ^ Casey, Quentin (May 25, 2016). "Molson Coors ushers in a new era for Canada's oldest brewery". Financial Post. Post Media. Archived from the original on January 19, 2017. Retrieved January 22, 2017. ^ "Spinnakers Artisan Crafted Vinegar". Eat Magazine. Eat Magazine. 13 December 2011. Archived from the original on 29 May 2014. Retrieved 29 May 2014. ^ a b c Justin McDonnell (24 July 2013). "Forget Portland: China Might Just Be the New Epicenter of Craft Beer". The Atlantic. Archived from the original on 27 July 2013. Retrieved 25 July 2013. ^ "Telegraph.co.uk Expat Directory". Expatdirectory.telegraph.co.uk. 2009-09-16. Archived from the original on 2013-12-03. Retrieved 2013-09-18. ^ "Arugam Bay Surfer's Beer". Facebook.com. 2013-09-14. Archived from the original on 2015-10-18. Retrieved 2013-09-18. ^ ERR News. Locally produced craft beer trend out of the bottle. ^ "Friday's papers: Labour settlement, alcohol sales, women earn most doctorates". Yle News. 9 February 2018. Retrieved 6 May 2018. ^ "Destatis Fachserie 14 Reihe 9.2.2" (PDF) (in German). Destatis.de. Archived from the original (PDF) on 2012-01-18. ^ "Brauereien in Oberfranken" [Breweries in Upper Franconia] (in German). Bierland Oberfranken. Archived from the original on 2014-02-03. ^ "Bord Bia Launches the 2017 Economic Impact of Craft Beer Report". 17 November 2017. Retrieved 4 June 2018. ^ "Accanto al colosso SabMiller, +1900% birre Made in Italy artigianali". giovanimpresa.coldiretti.it (in Italian). 13 October 2015. Archived from the original on 19 August 2016. Retrieved 9 July 2016. ^ "Japan Craft Beer Association". www.craftbeerassociation.jp. JCBA. Archived from the original on 30 March 2014. Retrieved 2 June 2014. ^ "www.drikkeglede.no Bryggerier i Norge" (in Norwegian). Archived from the original on 23 July 2016. Retrieved 9 July 2016. ^ "Llega la revolución de las cervezas artesanales" (in Spanish). Cultura.elpais.com. Archived from the original on 2013-09-10. Retrieved 2013-09-18. ^ "Cerveza de pequeña marca". Ccaa.elpais.com. 2013-07-27. Archived from the original on 2013-07-30. Retrieved 2013-09-18. ^ "Stefan Persson brygger hemma". Dagens Industri. 1 February 2006. Archived from the original on 5 March 2016. ^ Asia Eater (12 February 2014). "Asia Eater presents: Mikkeller Bangkok Opening" (Video upload). Asia Eater on YouTube. Google Inc. Archived from the original on 10 July 2014. Retrieved 13 March 2014. ^ Kristian Lauritzen (30 January 2014). "Danish Beer Bar Mikkeller grand opening in Bangkok". Scandasia. Scandasia. Archived from the original on 13 March 2014. Retrieved 13 March 2014. ^ Cole Pennington (10 March 2014). "Mikkeller floats Bangkok's stature as a beer berg". Coconuts Bangkok. Coconuts Media. Archived from the original on 13 March 2014. Retrieved 13 March 2014. ^ Glover, Brian (1988). "New Beer Guide". A Guide to Britain's Small Brewery Revolution. David & Charles. pp. 5–6, . ISBN 0-7153-9147-X. ^ "Blue Anchor". Spingoales.com. Archived from the original on 2012-02-20. Retrieved 2012-03-16. ^ "Blue Anchor". Quaffale.org.uk. 2012-02-23. Retrieved 2012-03-16. ^ Neil Hanson (ed), Good Beer Guide 1985, CAMRA, 1984. ISBN 0-9509584-0-9. ^ "LFW Travel Guides – Burnley, Turf Moor". Loft For Words. FansNetwork. October 2013. Archived from the original on 13 March 2014. Retrieved 13 March 2014. ^ Thomas Burrows (27 September 2013). "Ale campaigners fear Headington pub site will be turned into housing". Oxford Mail. Archived from the original on 13 March 2014. Retrieved 13 March 2014. ^ Adrian Tierney-Jones (26 February 2010). "Derbyshire pub guide: The Brunswick Inn, Derby". The Telegraph. Archived from the original on 22 April 2014. Retrieved 13 March 2014. ^ "The Watermill Inn, Ings, Cumbria". The Guardian. September 2013. Archived from the original on 2014-03-13. Retrieved 13 March 2014. ^ "Beer festival launches tomorrow evening at Old Cannon brewery in Bury St Edmunds". Bury Free Press. 22 August 2013. Archived from the original on 13 March 2014. Retrieved 13 March 2014. ^ Bristol Monday Night Club (26 May 2014). "Top 10 craft beer pubs in Bristol". The Guardian. Archived from the original on 29 May 2014. Retrieved 29 May 2014. ^ "Top 10 craft beer pubs in East London". Archived from the original on 2017-02-04. ^ "London Craft Beer Tours". Archived from the original on 2016-12-24. ^ a b Klemp, K. Florian (1 January 2008). "Barley Wine". All About Beer. Stylistically Speaking. 28 (6). Archived from the original on 29 April 2014. Retrieved 29 April 2014. ^ a b c Barajas, J.M. ; Boeing, G.; Wartell, J. (2017). "Neighborhood Change, One Pint at a Time: The Impact of Local Characteristics on Craft Breweries". In Chapman, N.G. ; Lellock, J.S. ; Lippard, C.D. (eds.). Untapped: Exploring the Cultural Dimensions of Craft Beer. Morgantown, WV: West Virginia University Press. p. 155-176. doi:10.2139/ssrn.2936427. Archived from the original on 2017-08-26. ^ "Silver Moon: A Beer Apart" (Video upload). Inc.com. Monsueto Ventures. 19 June 2014. Retrieved 21 June 2014. ^ "Craft Brewing Industry Statistics". Brewersassociation.org. Archived from the original on 2012-03-17. Retrieved 2012-03-16. ^ a b "How Jimmy Carter Saved Craft Beer – Max Fisher". The Atlantic Wire. 2010-08-05. Archived from the original on 2013-09-21. Retrieved 2013-09-18. ^ Stack, Martin H. (July 2003). "A Concise History of America's Brewing Industry". Economic History (EH.net) Encyclopedia. Archived from the original on 2013-01-16. ^ Acitelli, Tom (2011). "New York's Beer Debt to California". New York Observer. Archived from the original on October 14, 2012. Retrieved May 11, 2011. ^ Ogle, Maureen (2006). Ambitious Brew: the story of American beer. Orlando: Harcourt. pp. 291–99. ISBN 0-15-101012-9. ^ "Consumer Information." Alcohol Laws by State. Web. 17 Feb. 2015. <http://www.consumer.ftc.gov/articles/0388-alcohol-laws-state&gt[permanent dead link];. ^ Carrie Antlfinger; Todd Richmond (9 October 2013). "Shutdown means no new beer from craft brewers". Associated Press. Archived from the original on 12 October 2013. Retrieved 12 October 2013. ^ "BridgePort Brewing Co". Travel Portland. ^ "1st Five Brewpubs". Triplerock.com. Archived from the original on 2013-10-26. Retrieved 2013-09-18. ^ a b "Brewers Association". brewersassociation.org. Archived from the original on 2013-05-11. Retrieved 2013-05-19. ^ "Brewers Association | Number of Breweries". brewersassociation.org. 2011. Archived from the original on 21 January 2013. Retrieved 28 January 2013. ^ Association, Brewers. "Number of Breweries". Archived from the original on 16 April 2014. Retrieved 10 May 2014. ^ "Beer Madness: 32 beers compete for the top seat". The Washington Post. 2007. Archived from the original on 2016-08-25. ^ Oliver, Garrett (2011). "Craft brewing". In Oliver, Garrett (ed.). The Oxford Companion to Beer. Oxford University Press. p. 271. ISBN 0-19-536713-8. ^ "Brewers Association | Market Segments". brewersassociation.org. 2011. Archived from the original on 18 July 2011. Retrieved 21 July 2011. ^ a b Chris Crowell (10 March 2014). "Brewers Association updates 'craft beer' definition; focus on ownership, adjunct acceptance". Craft Brewing Business. CBB Media LLC. Archived from the original on 1 June 2014. Retrieved 14 June 2014. ^ Staff, Writer (2017-12-18). "Small brewers become big business in craft beer industry". Crain. Crain Communications Inc. Archived from the original on 2017-12-22. Retrieved 2017-12-21. ^ "The Beer Craze: India's Most Popular Microbreweries". Archived from the original on 2016-09-18. ^ "About Us – Barking Deer". barkingdeer.in. Archived from the original on 2016-09-18. ^ 2013, Omkar Deochake 19 Aug. "Welcome to DECCAN BREWING COMPANY, we provice Microbreweries in India, Microbreweries in Pune, brewpubs in Pune, brewpub pune, brewpubs, microbrewery consultancy, microbrewery consultancy in india, brewery consultancy, Microbrewery pune, Microbrewery india, craft beer india, craft beer pune, brewery machinery pune, brewery machinery indiaSanjay lazar, anita lazar, omkar deochake". www.deccanbrewing.com. Archived from the original on 2016-09-18. ^ "About us – Gateway Brewing Co". Archived from the original on 2016-09-18. ^ "SOUTHEAST ASIA NEW WAVE MIRCOBREWERY MARKET SURVEY INFOGRAPHIC". SEA Brew. SEA Brew. Retrieved 21 January 2019. ^ "Drunk History: The Tale of How Bia Hoi Came to Be". HOT TABLE. 2018-06-08. Retrieved 2019-02-11. Small Is Bountiful (January 2015), The New Yorker. "American craft breweries collectively now sell more than 16.1 million barrels of beer annually, outpacing, for the first time, Budweiser." Wikimedia Commons has media related to Microbreweries.